Tony Abbott: it’s called the House of Representatives, not the House of Rulers. A few days later, Abbott told us that his government will be putting forward a Bill to facilitate “the modern form of banishment“, allowing the Government to strip away citizenship from dual nationals at will. And according to Abbott, the Bill needs to bestow absolute power and discretion to do this on the government, unshackled by the normal rules of law and supervision of the courts. Then last week, Abbott issued a proclamation to his Frontbenchers – along the lines of ‘Thou Shallt not go on Q and A‘. He followed this up with a letter to the ABC, suggesting how he would like the program to be run. Listening to Abbott speak conjures up images of monarchs of old – like Henry the VIII – who chopped off many people’s heads, banished his enemies from the Kingdom and made royal proclamations – aka “captain’s calls” – at will. Abbott’s obsession with the monarchy is well-documented. Not only is he a staunch monarchist, but shortly after his election, he reintroduced the old-fashioned concept of Knights and Dames as Australian honors. 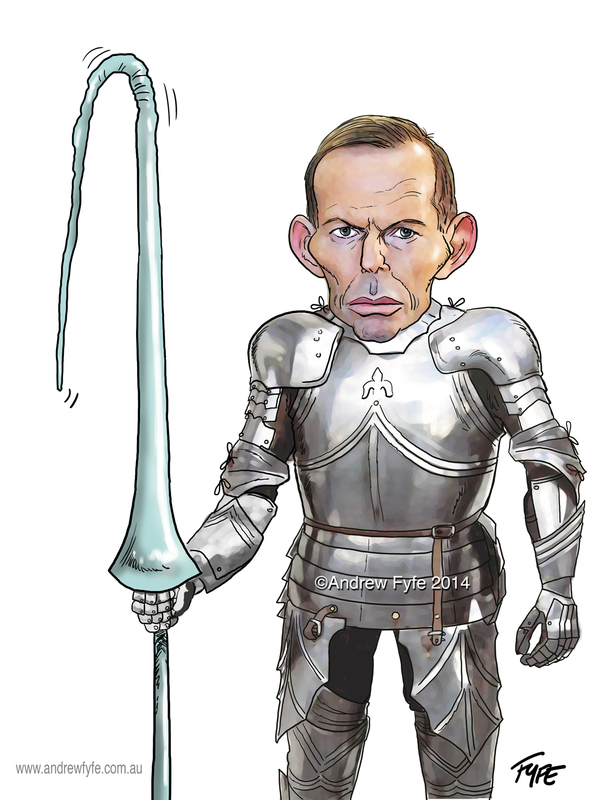 Abbott gave himself – in King like fashion – the power to make decisions about who will be knighted (or ‘damed’) without needing to consult with anyone else (other than the Queen, of course). Earlier this year, he then famously knighted Prince Phillip, in a captain’s call that nearly led to Abbott losing his own throne. This is the famous phrase often used to describe democracy today, which was first spoken by Abraham Lincoln in his Gettysburg address. The language is important – because it reflects what they are committing to do for the Australian people – and that is to act as servants, not as rulers. This means that their job is NOT to represent their own personal viewpoints, but to represent the views of their constituents. We elect them, we pay their salaries with our taxes, and we task them with serving our country. But somewhere along the way, many politicians seem to have forgotten that they are there to represent and serve us, not to rule us. This has never been better illustrated than with the current issue of marriage equality. With the vast majority of Aussies being in favour of it, passing legislation to enable it should be a no-brainer. But not so much. Rather than representing the people, many Ministers are representing their own viewpoints. Abbott’s love of making captain’s calls is well-known. But when he makes a ‘”Captain’s call”, he makes a decision without consultation, without seeking input from the peoples’ representatives in parliament. He confessed to this earlier in the year, when the #Libspill was on, suggesting that he would do less of this. But the Q and A call last week confirms that he’s still issuing proclamations and expecting them to be followed. “[Tony] is the captain – he can make a captain’s call”. No Malcolm Turnbull – Abbott’s not the captain of Australia. He’s not a King. According to the oath he took, he’s the servant of the Australian people. OK Mr Abbott – since you seem to be taking your lead from a bad episode of Game of Thrones – I’ll spell it out for you. What Australia needs of its political servants, and you as our current lead servant is…. Less of the ruling. More of the representing. This means all Australians, not just companies and people who donated to your election campaigns. Or even those 30% of people who somehow think you’re doing a good job. You swore an oath to serve “the people of Australia”, not just the ones you like. You don’t get to pick and choose. Less of the ruling. More of the representing. This means we have a right to know what is going on. As our servants you are acting in our name. It’s not Ok to hide behind excuses like ‘operational matters’, restrict our access to information and threaten to prosecute people who tell us about your stuff ups. Less of the ruling. More of the representing. No more of the saying one thing and doing another. If you say one thing on one day – like there’ll be no cuts to education, to health, to pensioners, to the ABC – your actions should reflect that. Nobody likes a servant they can’t trust. Less of the ruling. More of the representing. Stop saying you’ve done stuff when you haven’t. Like saying you’ve stopped the boats and saved lives. When quite clearly, you haven’t. If you had, there’d be no more people smugglers for you to bribe. Less of the ruling. More of the representing. Stop saying we’ve got to cut spending, and then allowing politicians to have ridiculous expense budgets. If our age of entitlement is over, so is yours. Oh – and as for the flag budget – one flag is plenty for a press conference. Ten just makes you look like a try-hard. A half million dollar budget is not good use of our money. Less of the ruling. More of the representing. We need to pull our weight in the region. There’s a humanitarian crisis in the region Abbott – and in the world more broadly, but let’s just focus locally. If Asia were a village, where each country was a family in that village – you’re making us look like the greediest rich family at the edge of town who ignores the plight of other members of the village, shuts its gates, and lets its poorer neighbours take care of those who have lost their homes in local disasters. Less of the ruling. More of the representing. Stop ruining the planet. Yeah – we know you love coal. And that you think wind farms are ugly. And that you’re incredibly proud of repealing the carbon tax and rolling back Australia’s commitment to halting climate change. But as the rest of the world does their best to save the planet’s atmosphere, and as some of our nearest neighbours are sinking into the sea, enough is enough. As our servant, you have a responsibility to look after our country, and stop ruining the planet we live in. And finally – Stop it with the pet projects. No more wind commissioners. No more school chaplains programmes. No more multi-million dollar royal commissions into stuff we already know. No more micro-managing late-night current affairs programmes – you should have better stuff to do. Australia doesn’t need a King – we’ve already got a swag of royals in the UK to keep our gossip magazines in business. We don’t need a ruler. And we don’t need a captain. We need someone who understands that they are here to serve the Australian people, and not their own personal or party’s political needs. And if you’re not up to it – and quite frankly, it doesn’t seem that you are – then you’re not keeping the oath you personally wrote and took, you’re not doing your job, and you should resign. Valid points – no argument from me. I’m trying unsuccessfully to figure out why anybody, anybody at all, would admit to a phone poll that they support the LNP or that they would prefer Abbott as PM – how can this be when every indicator shows Australia is in a mess and things are getting rapidly worse – economics, social compact, health, employment, indigenous rights, energy transitioning, environment and so much more. Is this an illustration of cognitive dissonance? Are these conservatives mentally blocking reality out in order to avoid the serious discomfort of knowing that your side of politics has changed and become the ultimate nation wrecker? I put a lot of it down to some people supporting political parties like they support a football team – they will be loyal no matter what. And they are convinced there’s no better alternative – not for any logical reason, but because that’s what they’ve always believed. I saw in a poll that the LNP still has 49% support in a most areas. This is mind boggling statistics. Also very frightening to think so many people cant see through these mental cases at the helm. You only have to listen to that Piers dipshit whatever his name is on insiders, god help us. Speaking of Insiders, how about that interview with Hunt. Surely that’s enough evidence that the lunatics have taken over the asylum. We need to stop this party at the next election by hook or by crook (to coin a phrase). Which will be quite a task with our one sided media. Not every one sees or reads sites like this to become more aware of the dangers of this government.